I know you have been on the edge of your seat waiting for part II of the 2013 recap! The course lived up to the hype and was indeed very beautiful (although I did not see the promised Moose drinking from the lake!) and the terrain very varied. I had heard tales of the hills and decided to take it easy, but I was pleasantly surprised that I kept waiting for them and never really found any ridiculous climbs. 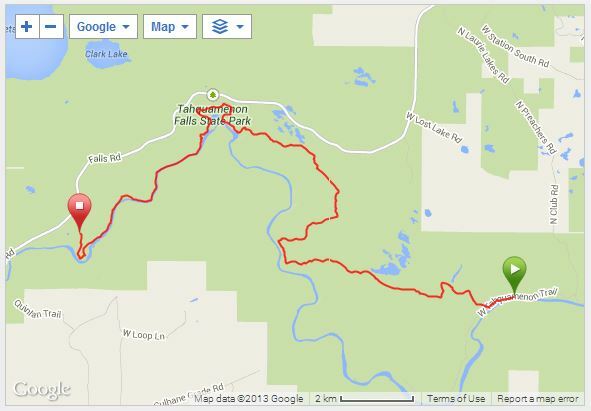 The last 10k of the course (which is also the full course of the 10k race) is from the lower falls to the upper falls. It is a hiking trail with lots of pretty significant roots (the organizer warmed about “roots as high as your shins” at the start) since I have a tripping tendency and had fallen on a trail a few weeks earlier and had to take a few days off to recover a “dead” thigh muscle, I decided to value finishing with my teeth more than my speed and again took it easy. Of course, I still fell twice on two completely non-technical sections of the path but lost only a little blood and no teeth! 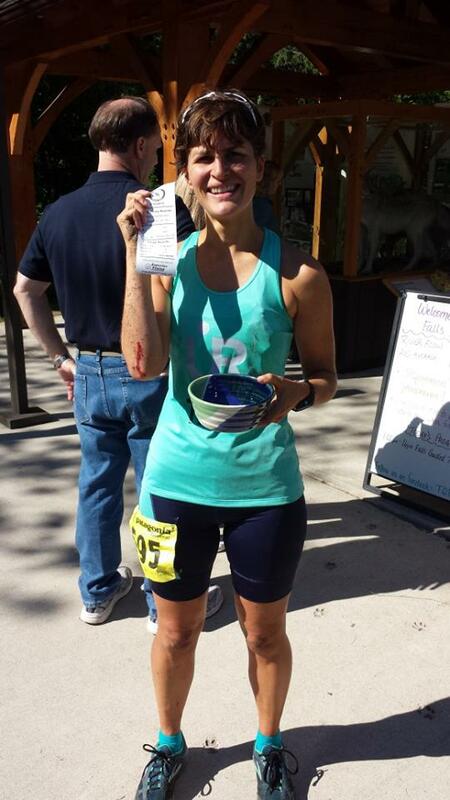 Age group placing, Artisan bowl and a little blood! The following day we hiked the last 10k of the race both up and down. I was informed that my support crew were now much more impressed with my bowl, and they promised to cheer a lot louder next year ;)…yep, they are already planning the camping for next year! Next up, for my birthday weekend I wanted to race the Crim in Flint. Ford put together two teams, so there was some fun team spirit. I had raced the Crim several years ago and enjoyed the atmosphere of the race through the different neighborhoods of Flint, for some reason I particularly remembered the students offering beer outside the frat houses! 😉 Considering it was August in Michigan, the weather wasn’t bad for the start of the race at 60 degrees, but 88% humidity and warming up in a hurry! All in all I had a great race, managed to pace myself through the hills and the rest of the course, I kept my cool when the pace group led by the Ninja passed me with a mile to go knowing they were ahead of their pace. As I rounded the final corner and was about to kick it to the line, an older runner in front of me started to veer to the right. I moved to pass him and just as I did, he fell to the ground. In the instant my mind switched from finishing to helping as I looked around for medical help. 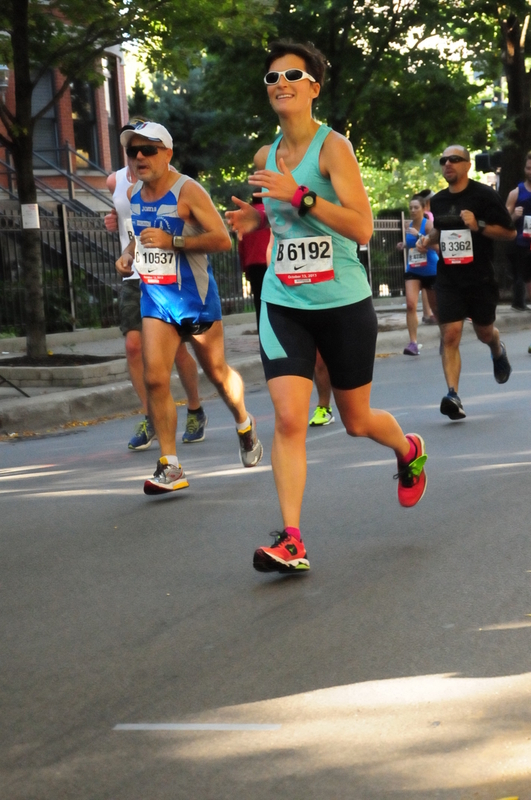 A lady came from the crowd to help, and told me to go on – she seemed to be suggesting to him that she would help him across the line, which was not what I thought he needed in that moment but I let her take the lead. So back I was to the finishing sprint! My garmin time across the line was 1:14:21….only 20 seconds less than my chip time. It sure felt like more than a 20 second stop – how our brain slows incidents like that down! A sudden stop right before the finish! Next up was the Capitol City River Run Half Marathon in Lansing. This is a half marathon that we had run the year before, it works well as a pre-Chicago half due to the timing. Somehow, in a Sunday morning fog I managed to forget my Garmin for this race – realizing just as I got far enough from home to make it too tight to turn around. As I drove I scoured my brain for what I could possibly do to remedy this, no ideas. I guess I was running naked! I ran into our friend Doug Kurtis at the packet pickup who kindly offered me his watch – I felt that was too much of an imposition for my forgetfulness but it was a super kind offer! So I positioned myself just in front of the pace group (yes you guessed it the Ninja again,,,I just can’t shake that guy!) and knew if I made a few seconds on them each mile I’d be on track! The last few miles were a little painful but finally new PR 1:38:18. Ok – so yet again this post is getting way too long! I think I have to make you suffer through a part III of this recap for the post Chicago fun to finish out 2013! 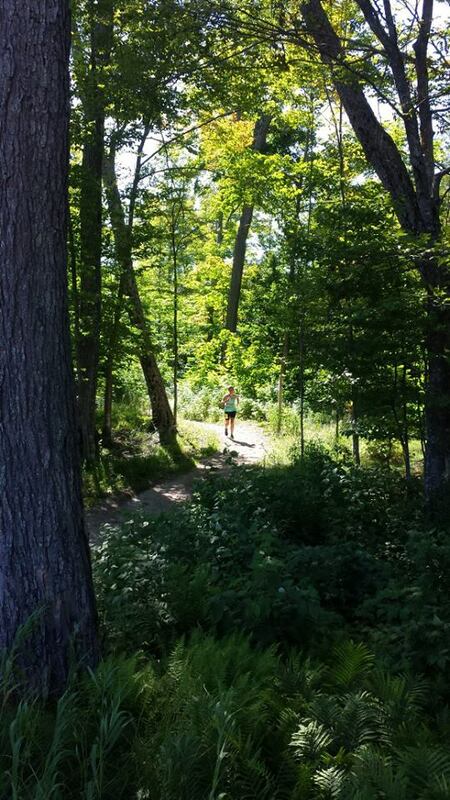 This entry was posted in Uncategorized and tagged 2013, Capitol City River Run Half Marathon, Chicago Marathon, Crim, North Country Trail, PR, Tahquamenon Falls, Taqua Trail run. Bookmark the permalink.